Everyone has different ways of "watching" birds. Some are leisure birders, they enjoy backyard bird watching and create a wonderful backyard habitat for resident birds; some like to photograph wild bird and they don't know much about birds other than snapping something beautiful; some birders chase birds for the purpose of "Big Year"; some like to pursuit rare or vagrant birds and will drive hundreds of miles to see only that particular wandering species. To me, the most amazing part of bird watching is knowing how diverse they are (there are about a little under 10,000 species) and how environmental changes and habitat loss might have impacted on them. 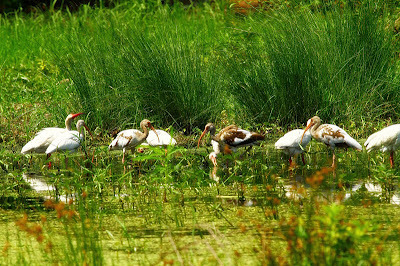 White Ibis, Jekyll Island ..Click image to enlarge. White Ibises prefer wetlands, freshwater and salt marshes or mudflats. Great photos Linda and like how you added all the information about the subject,well done.. Thanks Greg!My hope is for readers not only to enjoy my posts but also get to know bird's life and behavior and further more to protect the habitats they belong :) Have a great weekend!